This is by far the simplest form of a filter, which is primarily used for the removal of dust from the air in ventilators. These filters are made up of thick sheets of filter medium or comprise a combination of thinner materials that are folded together to encompass the same space as a pad. 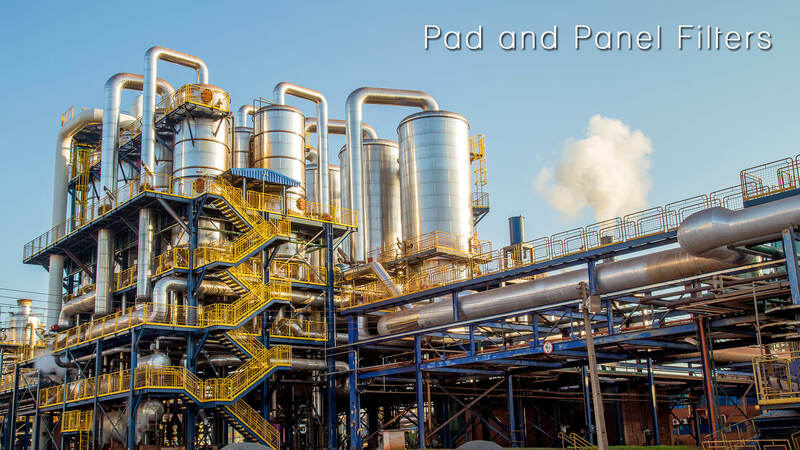 They are placed in a rectangular frame and fit securely in a corresponding rectangular hole within a divided wall.Pad and panel filters are manufactured in large numbers and in generic dimensions of inches since they are one time use filters. They can be pulled to a maximum of a couple of uses and clean cycles. Dust filters or pad and panel filters are used for the purpose of purifying the air of a workspace or home by preventing air pollution. This is done through the capture of contaminated particles from systems, machines, furnaces and other appliances. Further, these filters assist in the upkeep of machinery by preventing dust accumulation. The pad and panel filters are useful for any appliance, within which dust accumulation can cause a hindrance in efficiency and working. Moreover, in certain industries, such as gold and jewelry manufacturing units, these filters work to capture the dust that can have economic value. The filter requirements are subjective to the size of the dust particles and its concentration in the medium of air or gas around. Where the concentration is greater, the optimal choice would be a separator that is in the form of a cyclone within the filter or a simple settling chamber. This would prove useful when the dust particles range around 0.5mm in size. However, generally, dust particles that are below the size of 1m are elusive and do not cause concern. The mechanics of dust collection encompass every entrapment procedure, with special focus on the effect of electrostatic forces. The process of filtration of dust is undertaken through depth filtration, within which arena the pad is considered quite effective. The filter pad is a type of panel filter that is most often installed in air-conditioning appliances. This thick and absorbent flat sheet is made up of fibrous material through the process of wet-laying or dry-laying that is done by paper or felt respectively. The latter is more commonly seen due to a higher degree of usability and versatility across various primary materials. These pads are then fitted in a container that provides them with the sustainability and is covered with a grill on both sides. The grills are made up of a wire mesh, expanded or perforated sheets, which provide the finished look. These finished filters are then placed either in a singular setting or in multiple avenues of similarly sized spaces in the allotted area. They are constricted through a retaining lip or by clips and bolts along the downward element of their placement. The filters are manufactured and placed in a way that is not optimal for routine cleaning and therefore, they are not used for long periods and come with the disposable characteristic. This is because the design element does not allow efficient reuse once the pad has maximized on its absorption capability. The filters that are created by using thin sheets as their material and work along the surface are called filter panels. Due to the restrictive nature of the thin sheet, these filters are corrugated by the method of pleating with concertina-like folds that run parallel along one length of the panel. Every pleat is as deep as the containing frame for optimal working. Although usually done in a coherent fashion, these pleats can be formed at any spacing, according to a specific requirement. They sometimes form a wide V shape or a narrow U shape. The only specification in the installation of filter panels with pleats is to ensure that the complete area of the filter medium is available for the process of filtration. The filter panels that are designed with narrower pleats run the risk of pinching together, which will ultimately cause them to loose filtration area. The solution to this is to install spacer sheets between the folds of the medium, in a manner that is perpendicular to that of the medium. Panel filters are manufactured through the use of various materials that are capable of pleating efficiently, without the risk of cracks developing along the folds. Examples of such materials are cellulose, glass paper, wired cloth, woven and nonwoven fabrics, felts, membranes, etc. If the filter is being made with charcoal cloth, it is imperative to undertake pleating before charring. However, synthetic fiber mediums are the most common materials used for panel filters as they have significantly demonstrated their ability to be adaptable to the ventilation system of variant surroundings, ranging from domestic, commercial, and industrial to institutional establishments. Filter panels come with a higher capacity of filtration efficiency when installed as a series, with a pre-filter that is made up of some coarser material. The pre-filter would work to act as a blocking space for the larger air particles that if allowed to seep through, would reduce the efficacy of the panel filter by blocking it entirely.